But I did buy a pile of my faves. Full yards of the blues, 1/2s of the greens, all from my fave LQS. The dinos and the minerals make me soon happy. One of my grandpas was a geologist, and they make me think of him. The stars are for Annie my astronomer. And the whales for Henry, my marine biologist. And then… I was drooling over the new mini pearl bracelets, and low and behold, an FQ bundle appeared on Massdrop. I’ve made a few purchases through them, and have been very satisfied so far. I’m waiting for another package to show up, that I can’t wait to show you. If you haven’t signed up yet, and you’re so inclined, you can sign up through my link and I might earn rewards. Meanwhile, aren’t they soon pretty? My only regret is that there’s not a better purple. But you can’t have it all… I’m hoping this line will be followed by a mini TONAL pearl bracelet release. That would be perfect. 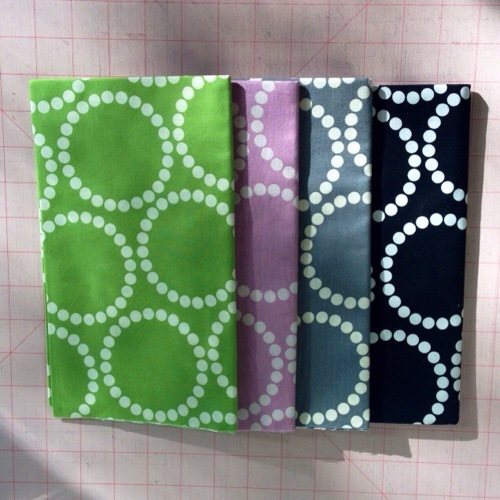 I think these pretty fabrics are helping me get back into the groove. Stay tuned to see what I’ve gotten up to. Linking up with Molli Sparkles and Sunday Stash. and hit the Denver County Fair (disappointing this year, for the first time ever). And the next day we went out to brunch, with bottomless mimosas. And that’s where the Public Service Announcement comes in. Don’t drink multiple mimosas and then go to a fabric shop having a 40% off everything moving sale. Um, 26 yards of fabric, 4 spools of Aurifil, a pattern, and 2 packs of Kaffe Fasset shot cotton charm squares. First, 6 yards of plain white went straight to be prepped for tomorrow’s adventure: indigo dyeing! Annie and I will be joining a fab friend to try it for the first time. And possibly due to my happy brunch buzz, I let the kids pick out fabrics. Science themed organics, crowns, and Tardis blue solid. Ninjas, throwing stars, bow ties and bacon. 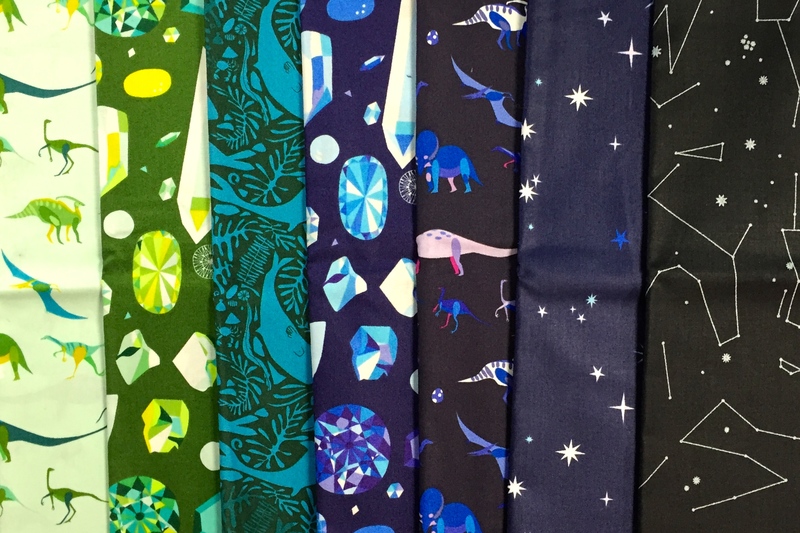 Cute animals- expect to see the hot pink in my Tula blocks ASAP, a fab blue print, a fun purple halloween print, and 3 yards of the amazing Maude Asbury Xmas print. I needed some grey Aurifil (I had just started my last spool), and the blue is for Annie’s Tardis quilt- not yet started. And purple? I can always use more purple. As for the Swoon pattern, I had been seeing amazing swoon blocks all over the interwebs but never got around to getting the pattern. So now I have it. And you can never have too many Kaffe shot cotton charm squares. Maybe I should have bought another pack? And, not pictured, Annie found a spirograph set which I agreed to get for her. The fabric was all 50% off, and everything else 40% off. So this looks obscene, but, at least it was a good deal. I’m not certain I have ever seen a fabric launch as widely covered by the quilt blog world as Cotton & Steel. I admit, I quite like the line, but goodness, it’s crazy out there. Right there at the register was the leftover yarn from the Stephen & Steven Tour 2014. (For the third consecutive year, I missed Stephen West’s teaching and tour stop at Fancy Tiger. I am starting to believe that he checks my vacation schedule before booking time in Denver…) Several friends went to the trunk show and/or took classes, and offered to pick me up some of the exclusive yarn. But it is VERY spendy, and I responsibly declined their offers. And then, over a week later, there was some just waiting for me. And I still had that 20% off coupon burning a hole in my pocket (or actually, on my phone, since it was from an app.) So when that gorgeous skein called out to me, I was able to answer it. Over the past few weeks, I’ve piled up quite a few pieces of pretty fabric, but haven’t told you about them. This is sort of the April catch-up Sunday Stash post- and if you hang out to the end, there’s a surprise! I’m trying to add some more pinks to my City Sampler blocks- #9 is still hanging out there all alone, and that needs to change. Next, the Tulas. Because apparently, there’s always new Tula here. Acacia, Saltwater, AND Foxfield all in one. And from 3 different sources to boot. Because unicorns. And because Annie loves ponies and horses. And because the colors are fun. And if you’ve made it this far, you can see my one final Sunday Stash item. This item is totally NOT fabric. This item is around 60 years old. I totally have no need for it. I’m not sure I have the skills to use it. And $25 would be 2 yards of new fabric. But, I really wanted it. I love to look at vintage machines. They’re so nifty! And I’ve never owned a Pfaff. When it came time to pack up our sale, I went to see if I could bargain with them. They agreed to take $15.00 for it. And so I have a new, old machine. The absolute best part is that they still had the entire original manual, encased in protective plastic sleeve. The manual itself is a treasure. The machine works- light comes on, pedal and needle work, etc. We’ll see if I learn to use it, or just keep it as decor. 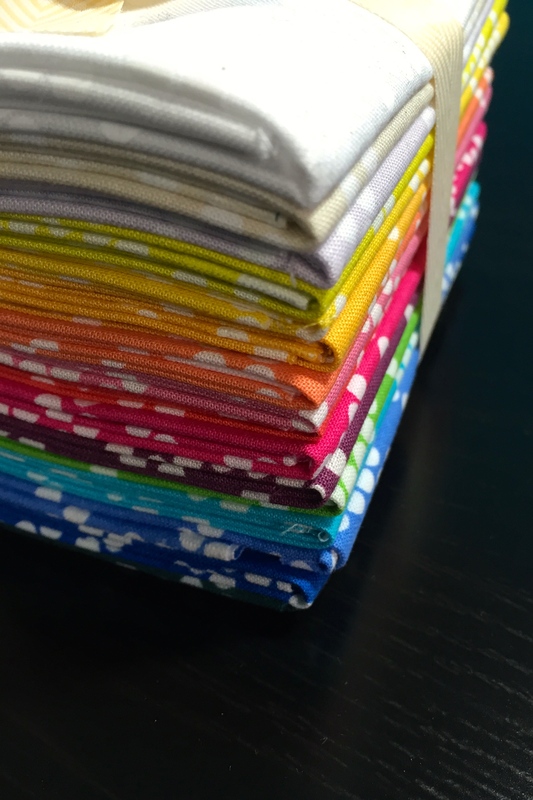 I dithered around when Quilt Home was having their Tula sale, and by the time I decided to place an order, half the fabrics I wanted were sold out. Bad for me, better for my budget. The top 4 fabrics came from Quilt Home, and the bottom, the fabulous amazing signature Fox Field Foxtrot print, came from a local store. And I only got one yard of it. Because I hadn’t been into this shop in ages- they carry delicious modern fabrics by all the designers I love, but I remembered them as a bit pricey. And I remembered right- $12.99 a yard for the Tula! Ouch. They had the whole line, but I couldn’t afford any more at the moment! Sigh. Meanwhile, I have this excellent pile of Tulas to go into many projects, but especially my City Sampler blocks. Hope you had a wonderful stash week! Linking up with Sunday Stash. Sunday Stash: blenders… and news! Working on Meow Mix has pointed out the holes in my stash- especially yellows and oranges. (And it has also confirmed that I loooooove purple.) 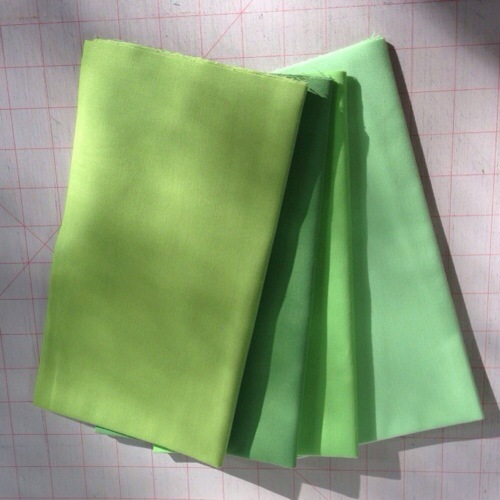 I need more fabric like I need a hole in my head, and yet, when I got an email from Fabricworm with a good coupon, I placed an order… which contained yellows, and of course, more purples… I was thinking blenders. I need more blenders. Don’t you kind of always need more blenders? But it is intended for such a wonderful project- read on. I am lucky enough to have a room dedicated to my sewing. It used to double as an office, in the time before we all used laptops and tablets for everything, but for the last few years, it’s just been for sewing. And storing fabric and yarn, of course! Over the past few months, as I’ve been getting my sewing groove back, I’ve been thinking about ways to better utilize my space. The furniture in the room is a miss-mash of leftovers, most of which do not work so very well. The book shelves I use to store my fabric have shelves that are too deep, and it’s so hard to look get the fabric out and use it. And then putting it back away neatly takes sooooo much time. I have a “design wall” (felt backed plastic tablecloths tacked to the wall) but my cutting table and ironing board make it hard to use them. My cutting table is oval in shape, and takes up more room than it needs to. So what to do? I started searching Pinterest and the interwebs for crafty space inspiration. I’ve long wanted to use Ikea Expedit bookcases, and when I mentioned that in passing to my husband, he let me know they were being discontinued! Noooooo… Time to speed up my plans! A quick trip to Ikea netted a few pieces, in black instead of white as the white selection had already been decimated. I not so subtly hinted to Rich that he should start putting the Expedits together right away, but he pointed out that maybe I should finish my overall plans first. But he was, and it has worked out really well. Part of why we chose our current house was the finished basement. It has a guest room, as well as the laundry room, and one large room that became the playroom. We stashed most of the kids’ toys down there, and also a TV and some comfy furniture, so they had their own space to enjoy and also mess up… But at nearly 13 and 10, they don’t really use it anymore (we moved in when they were 3 and 1.5 years old.) I sat down and talked with them, and they agreed that it would be okay for me to turn the playroom into my sewing room! It’s about twice as big as my current sewing room! And even though it’s in the basement, we have a tri-level house, and the basement has windows. So, double the space along with light? Hooray! The big move is planned for mid-April. When my office (a school) is closed for Spring Break, I have 7 days paid time off! (Plus a weekend in there to boot.) I’m planning on spending nearly all day every day of break setting up the new room. I am so excited! 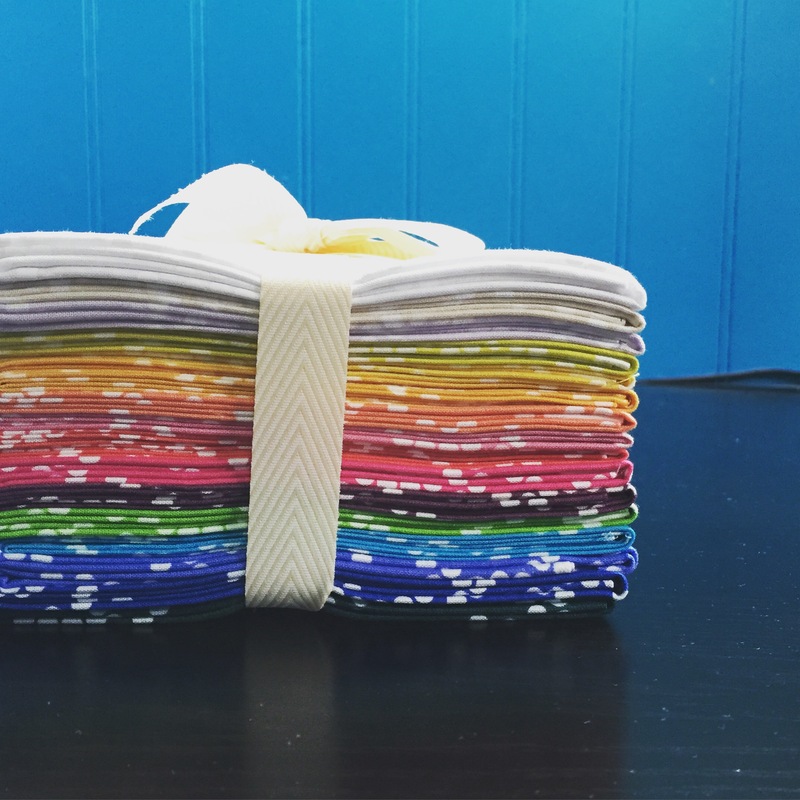 Do you have any tips for storage or setting up a workspace that have made your sewing experiences better? I’d love to hear them! 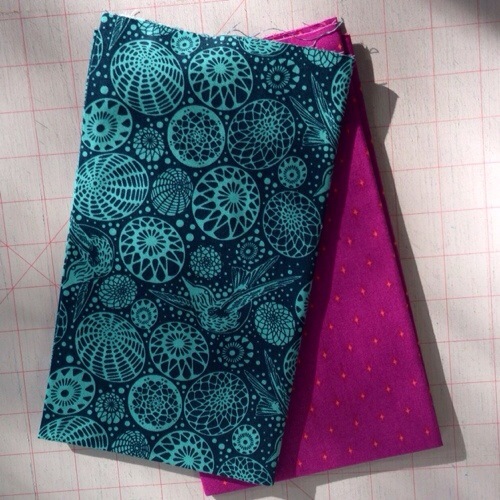 It’s another week of non-quilt shop quality fabrics… but man, oh man, are they fun or what? I was at JoAnns picking up some random things, and Henry spotted these. We’re doing our best to raise our kids up as geeks, and last year, we started streaming the original Star Trek series from Netflix. If you haven’t gone back and watched it since you’ve been a grown up, I heartily recommend it. The kids still prefer Doctor Who, but they quite love these guys, too. 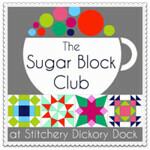 Linking up with Sunday Stash before I settle in to watch the Oscar red carpet… Hope you had a fabric-filled week! 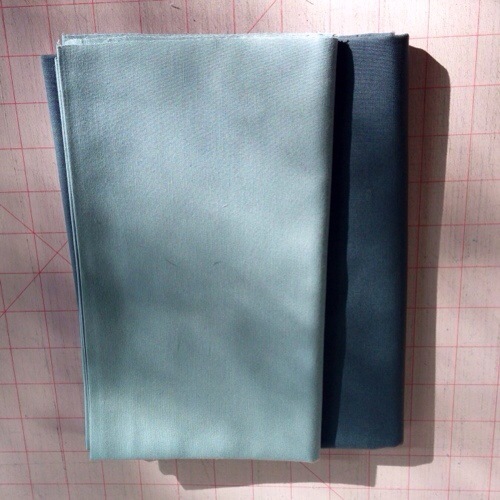 The Fat Quarter Shop has Moda Bella solids at 20% off all month long, and I really needed a few new colors. Aside from fleshing out my stash for my Tula Pink City Sampler blocks, I need them for the Catvent quilt I’m about to start. 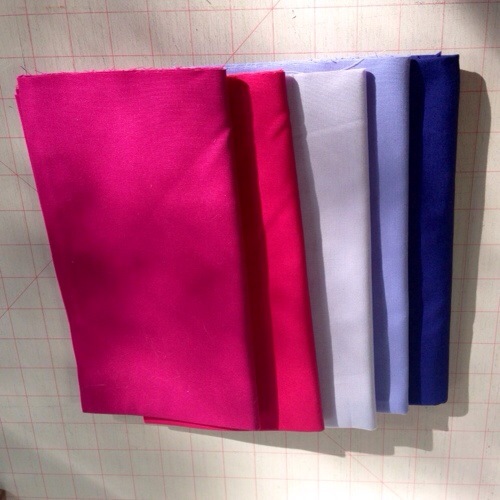 First up are the pinks and purples: Shocking Pink, Berrylicious, Freesia, Amelia Lavender, and Terrain Iris (1 yard of this one). Next up are the greens: Amelia Green, Grass, Honeydew, and Pistachio. Finally, two tiny pieces of Tula that should blend beautifully into my City Sampler blocks. Acacia Midnight Hummingbird and Acacia Raspberry Diamonds. Now, to finish quilting my giant skull, so I can start cutting into these! Hope you had a week full of wonderful fabrics!